Goin’ to Dead & Company? We can’t wait to duck our faces for Dead & Company at Autzen Stadium this Saturday since we haven’t seen our beloved Dead there since ’94. As lifelong deadheads we are grateful to support this music in any shape it forms and keep the faith alive with love, light and respect for all things good and kind. 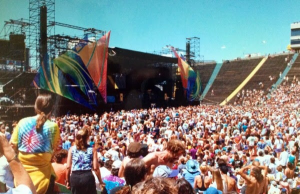 🎶 🎤 ✨ We will be shaking our bones all day on shakedown so please come visit our booth with rarely seen photos from Veneta ’72 and some beautiful Jerry Art. 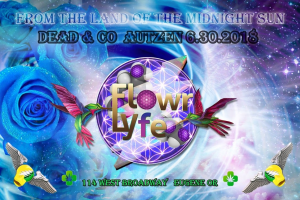 We will also have free commemorative DeadCo Autzen FOL stickers, coupons, swag, some free dabs and lots of good vibes. Remember if you want the frostiest, organically grown buds at melting prices come to Flowr Of Lyfe at 114 W Broadway in the epicenter of downtown Eugene and with us pursue Lyfe, Liberty and Happiness. No hydro or chemically grown schwag flowers here so get yourself back to the garden with $2 grams, $30 ozs, $10 grams of shatter and lots of parkingcuz downtown is fun again where the blossoms are bloomin’. We are always loyal to soil so don’t get caught in the weeds and as always, Stay Frosty My Friends.